Good Monday morning. Administration insiders say they expect President Trump's Supreme Court pick today or tomorrow, moved up from Thursday. The announcement will touch off Washington's biggest battle since the election, with millions spent on each side, including massive campaigns in the states of key senators. Thanks for starting the day here, then check out the Axios STREAM all day for screen-sized updates that'll make you smart fast on business, tech, media trends and politics. Our cool "Keep reading" function gives you a drop-down so you can continue without leaving the stream, and signals how many words are ahead. And asked about the softening yesterday of the administration's stand on green-card travelers from the seven restricted countries, a senior administration official told our Jonathan Swan: "The only issue is the media created an issue that never existed, and then asked us to resolve an issue that never existed. … The EO [executive order] is not going to be changed." Republicans worry … about the massive fundraising opportunity this provides the left. CNN's Brian Stelter reports the ACLU's weekend's online giving was 356,306 donations, totaling more than $24 million: "The civil liberties group normally raises about $4 million online per YEAR." The big picture: "In a Week, Trump Reshapes Decades of Perceptions About America," by N.Y. Times' David Sanger: "By some measures, President Trump has altered the perception of American foreign policy more in the past seven days than his predecessors did in the past seven decades.A nation that built its brand around the world as open to the world's needy and ambitious is now viewed … as closing its doors in a way it never did even after the Sept. 11." Oof! House Homeland Security Committee Chairman Michael McCaul, a Texas Republican, to the Wall Street Journal, in a front-pager headlined: Trump Team Kept Plan for Travel Ban Quiet": "In the future, such policy changes should be better coordinated with the agencies implementing them and with Congress to ensure we get it right—and don't undermine our nation's credibility while trying to restore it." Collateral damage: L.A. Times Brian Bennett: "National security experts and even some Republican lawmakers believe that Trump's executive orders … are more likely to inflame resentment against the U.S. than to make the country more secure." ISIS reacts … WashPost's Greg Miller and Missy Ryan: "Postings on social-media sites linked to the terrorist group predicted that President Trump's order would galvanize Muslims and claimed that it showed that the United States is at war with Islam." Green light for green cards … "Homeland Security Secretary John Kelly issued a statement [yesterday making clear that] citizens of the seven target countries who hold permanent U.S. residency 'green cards' will not be barred from re-entering the U.S., as officials had previously said." Allies balk: "UK under pressure to cancel Trump state visit" — AFP/London: "More than one million people had signed a petition on Monday demanding Britain cancel plans for a state visit by … Trump following his ban on travellers from mainly Muslim countries." At the Screen Actors Guild Awards in L.A., "much of the ceremony played like a rally of the resistance," per Hollywood Reporter: "'I am a citizen of the world," Ashton Kutcher said … Speaking to 'everyone in airports that belong in my America … You are part of the fabric of who we are and we love you and we welcome you.' … [A]lmost everyone who took the stage chose to speak … about the current political climate, with many remarks aimed directly at … Trump." 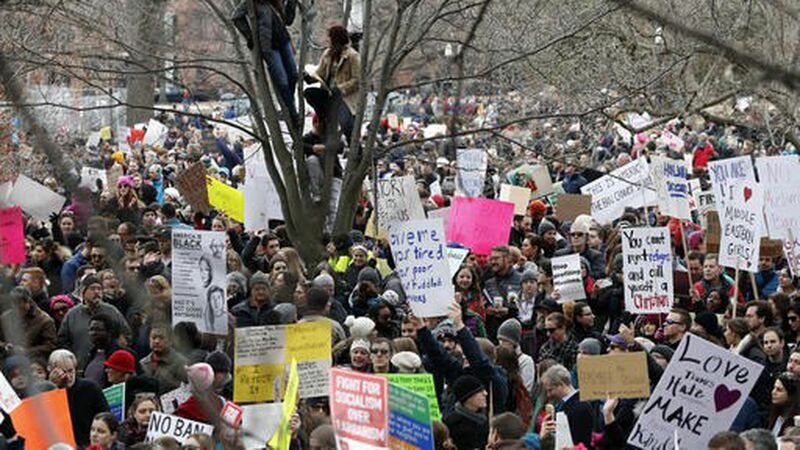 In Philadelphia, 5,000 demonstrators jammed the International Arrivals hall, and 1,000 spilled into the arrivals vehicle lane outside, disrupting passengers trying to leave. At LAX, as lawyers filed court papers on behalf of detained travelers, thousands of protesters shut down traffic in front of the Tom Bradley International Terminal and faced off with police in riot gear, chanting: "Let them in!" In San Francisco, more than 1,000 protesters forced the temporary shutdown of security checkpoints. Jim VandeHei and I posted an updated list of chief strategist Steve Bannon's power plays and signs of his rising clout: Understanding his worldview is the Rosetta Stone to Trump's rhetoric and actions. In an above-the-fold N.Y. Times front pager, "Adviser Seizes A Security Role From Generals," Glenn Thrush and Maggie Haberman add this layer: "People close to Mr. Bannon said he is not accumulating power for power's sake, but is instead helping to fill a staff leadership vacuum created, in part, by Michael Flynn's stumbling performance as national security adviser. Mr. Flynn still communicates with Mr. Trump frequently, and his staff has been assembling a version of the Presidential Daily Briefing for Mr. Trump, truncated but comprehensive, to be the president's main source of national security information." Their colleague David Sanger has palace intrigue on Bannon's elevation to the National Security Council's Cabinet-level principals' committee, "and the diminishment of the president's top intelligence and military advisers": "[M]ilitary officials said they suspected that the decision, in part, was prompted by the national security adviser, Michael T. Flynn … Throughout the transition, Mr. Flynn was reportedly hesitant to place many people around the National Security Council table who had outranked him in the military." What's being done to help unintended victims -- kids, vets, etc.? Any concerns about the airport chaos? What consideration is being given to hardship cases for people who are in imminent danger in their home countries? Snapchat, expected to file for its IPO late this week, "boldly compares itself with TV" in conversations with investors, per Mashable. One media executive who talks to the big platforms said: "Facebook, Amazon, even Apple are willing to write massive checks, tens of millions, hundreds of millions, to build specific content for that platform." —Why Snapchat plans more shows: "Few on the street recognized Peter Hamby, Snap's head of news and host of 'Good Luck America,' when he was a political reporter at CNN. Now, he's the 'Snapchat guy.' Exclusivity, Snapchat says, means quality." Axios' Kim Hart draws on her wide sourcing and deep experience for "Why tech CEOs fear Trump": "[T]hey fear Trump will single them out for outsourcing jobs or shut down the so-called H-1B visa program they use to hire high-skilled foreign employees for crucial engineering and technical jobs." What's coming: "White House officials tell us they are right to be nervous, especially about changes to the visa program. Chief strategist Steve Bannon and policy chief Stephen Miller are known to be deeply skeptical of the program, and will have a strong, vocal ally when Jeff Sessions gets confirmed as Attorney General." The routes: "Short of shutting down the visas, Trump could administratively strangle the program or work with Congress to significantly slash it, immigration experts told Axios." The reaction: "Fears of being the subject of a Trump tweetstorm shaming big H-1B users could prompt companies to cut back on their visa applications. Even tech companies that follow the program's rules to the letter would prefer to avoid a PR nightmare." What's happening: "More than 100 of America's biggest companies … are scheduled to report quarterly results. Among them are tech giants such as Facebook Inc., which is expected to be the largest contributor for earnings growth in the technology sector, and Apple Inc., which is forecast to provide the largest drag." The mood: "[M]any executives last week emphasized their optimistic outlooks." But … "Data released Friday highlighted that the U.S. recovery remains fragile." Jack Quinn, White House counsel to Bill Clinton, will leave Quinn Gillespie & Associates in March to begin a new "Law and Strategy" venture based in D.C. Quinn told us he likes practicing law and will use that umbrella to build a network for corporations that need help with investigations, litigation or expansion. Quinn will also serve as a senior adviser to Burson-Marsteller, keeping him in the WPP family, and will expand his advisory and investment activities with emerging companies and technologies. Just posted … "Samantha Bee to Roast Trump on Same Night as Correspondents' Dinner," by NYT's Dave Itzkoff: "Ms. Bee … and her colleagues are planning a counter-event that will take place in Washington on April 29, the same night as the Correspondents' Association dinner." Wednesday is National Signing Day, when highly recruited high-school athletes commit for college, with the most prized recruits theatrically donning the winning cap for their local news or even ESPN. But it looks like this is the last year for the spectacle, since the NCAA is creating a new signing period in December. Why that makes sense: "All the freaking out and fawning over players who have never played a college game creates unrealistic expectations for the newbies and to some seems unfair to the ones already on campus." THANK YOU for reading, and have a great week. I'm grateful for the links, pics, docs and thoughts that you're sending me. Just reply to this email: It's my real e-dress, and no one else sees it.